Studying for the GRE on your own? 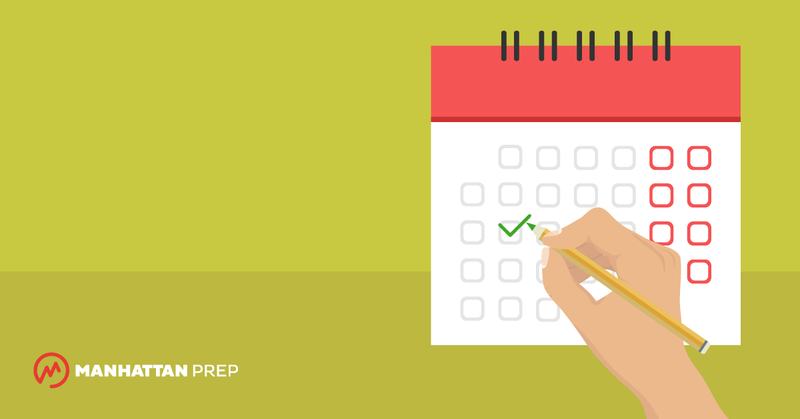 Load up your GRE study calendar right now—it’s time to get organized. Start by filling in your test date. Not sure when you’ll take the test? Just pick a date that’s in the right ballpark. Plan to spend the two days before your test relaxing, mentally preparing for test day, and doing some light, easy review problems. Next, mark down any travel or commitments you have coming up. Be realistic about what will and won’t affect your ability to study. You don’t want your whole plan to revolve around studying hard during your beach trip, only to realize once you get there that it’s not going to happen. 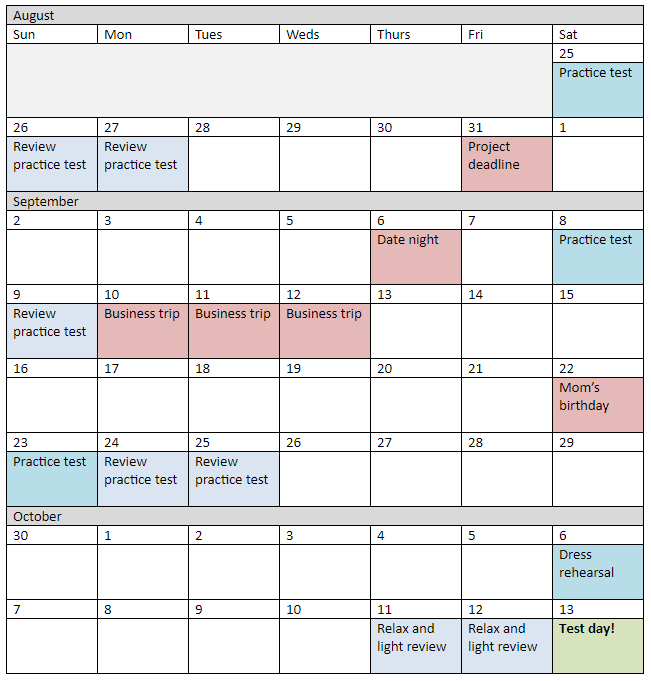 Count backwards from your test date by about one week, and choose a day for your dress rehearsal. This is your last practice test, so choose a day when you’ll be able to give it your full attention. On dress rehearsal day, do everything exactly how you’ll do it on test day: timing, scratchwork, breaks, everything. Next, count backwards another two weeks. You should take and review a GRE practice test about every 14 days—and no more often than every 10 days. Since the GRE is a long test, for many of us, that’ll mean taking a practice test every other weekend. Put these practice tests on your GRE study calendar now. Also, give yourself at least three hours (ideally, over two study sessions) to review each test. Think of your GRE studying as coming in three phases. Early in your studies, you’ll be spending most of your time learning content. Close to test day, you’ll be spending most of your time practicing problem-solving and staying sharp with what you already know. In the middle, you’ll be doing both of those things—brushing up on a few topics, but also practicing your problem-solving skills. Don’t get overwhelmed: start by only filling in the first two weeks of your GRE study calendar. Your needs and goals will change as you take practice tests and learn more about your performance. Areas that showed up frequently on your practice test (think Fractions or Sentence Equivalence, not Combinatorics or Logical Reading Comprehension). Areas that are just a little too tough for you right now, or that take you just a little too long. Choose about 3-5 focus areas to start with. That seems like a lot, but it’s actually better for your brain in the long run if you jump around between topics, rather than just working on one until you’re exhausted. Read the Manhattan Prep Strategy Guide chapters on the topic. Do the end-of-chapter problems in the Strategy Guide. Do some problems from the relevant chapter in the 5lb. Book of GRE Practice Problems. Watch the relevant lesson in GRE Interact, and/or do the Drill It problems on the topic from Interact. You don’t have to do every one of these things for every single topic you study! Use what works best for you. Unless you only have a short time to study on a particular day, try to include two different topics. You should also go back to previous topics on later days. That’s called interleaving, and it helps promote memory formation. On top of that, dedicate at least one day each week to reviewing your problem log and redoing problems you missed in the past. Okay! 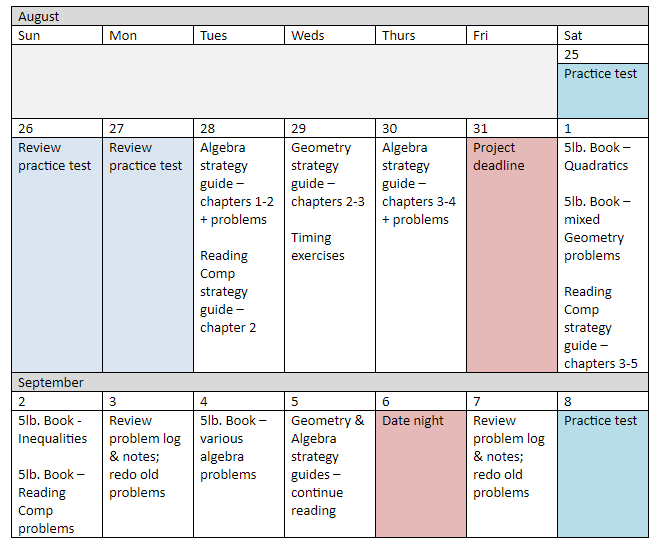 Now we’re ready to zoom in on the first two weeks of our example GRE study calendar. Suppose that this student was much stronger on Verbal than on Quant, but also missed a lot of Reading Comprehension problems. In Quant, she did pretty well on word problems, but found that she’d forgotten the basic algebra and geometry rules. This student is starting her first week, once she finishes reviewing her practice test, by brushing up on the rules for Algebra, Reading Comprehension, and Geometry. 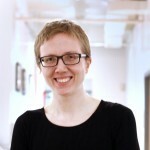 As the second week starts, she mixes in more GRE problems on the topics she was weak on. She also builds in two review sessions before her second practice test. Importantly, she takes two days completely away from studying.